Great find on a wet day. 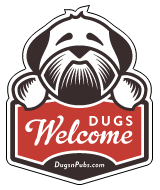 Dog friendly with a warm welcome. Close to the Union canal, bridge1. Dog treats and water offered as well as plenty of attention for Isla our Labradoodle. Food was delicious, sort of tapas menu, although larger meals on offer and coffee great. Definitely worth a visit. The Fountain (right across the street from Fountain Park) love to have dogs in! Lovely place to grab some great food or a good drink with comfy couches etc! My dog goes with me all the time!